In broad daylight, in an alley behind some buildings, three or four lifeless bodies lay scattered across the ground. An SUV arrives and several police officers get out of the car. One of them scouts the area, seems to verify nothing is out of place. He pushes one of the bodies aside with his foot to make room. Two of his colleagues produce a thin man who was sitting in the back of the car. The man knows what is going to happen, but he remains calm, doesn’t try to escape. He is held by his arms, and at that final moment, looks away. He is ordered to stand straight, he obeys. A loud bang can be heard. The body seems to disjoint and stumbles to the ground with the others. 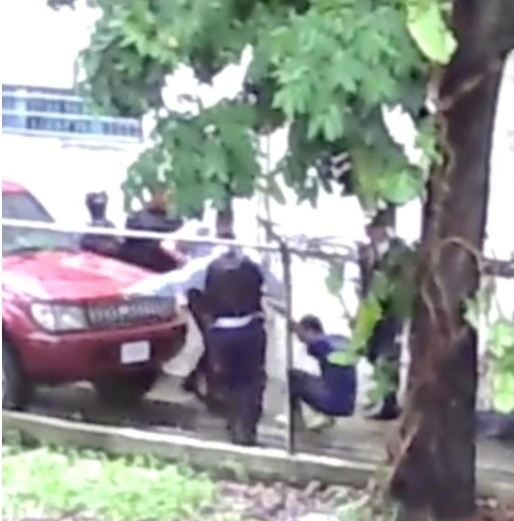 This cellphone video, shot in Aragua State by a person in hiding, was released by El Nuevo Herald two days ago. We hope that the above description will be enough to spare our readers from having to watch it. It is beyond disturbing. It wasn’t me, it was the capitalism implanted in my brain. Tareck is the Manchurian Candidate.